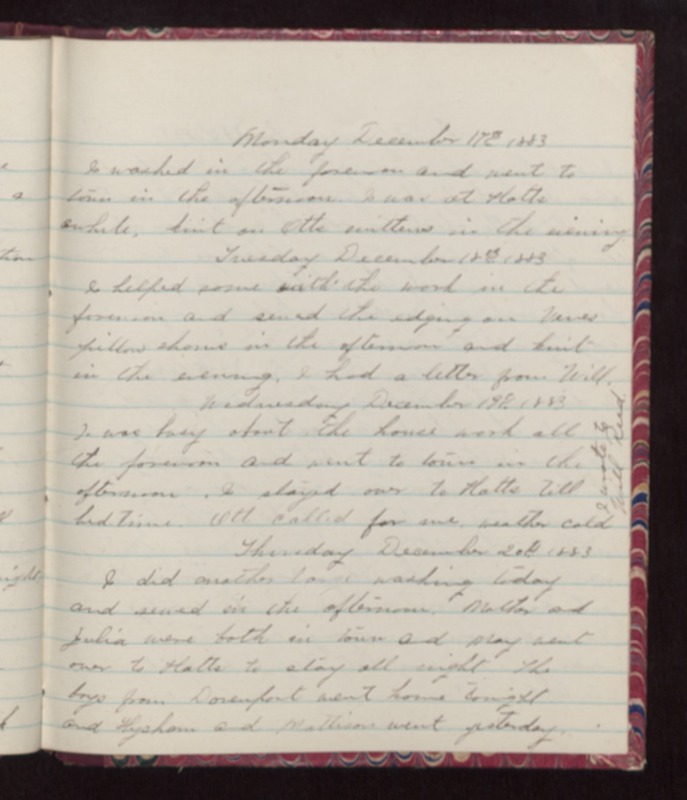 Monday December 17 1883 I washed in the forenoon and went to town in the afternoon. I was at Hatts awhile, knit on Otts mittens in the evening. Tuesday December 18 1883 I helped some with the work in the forenoon and sewed the edging on Venes pillow shams in the afternoon and knit in the evening. I had a letter from Will. Wednesday December 19 1883 I was busy about the house work all the forenoon and went to town in the afternoon. I stayed over to Hatts till bed-time. Ott called for me. Weather cold. I wrote to Will Reed. Thursday December 20 1883 I did another large washing today and sewed in the afternoon. Mother and Julia were both in town and May went over to Hatts to stay all night. The boys from Davenport went home tonight and Hysham and Mattison went yesterday.